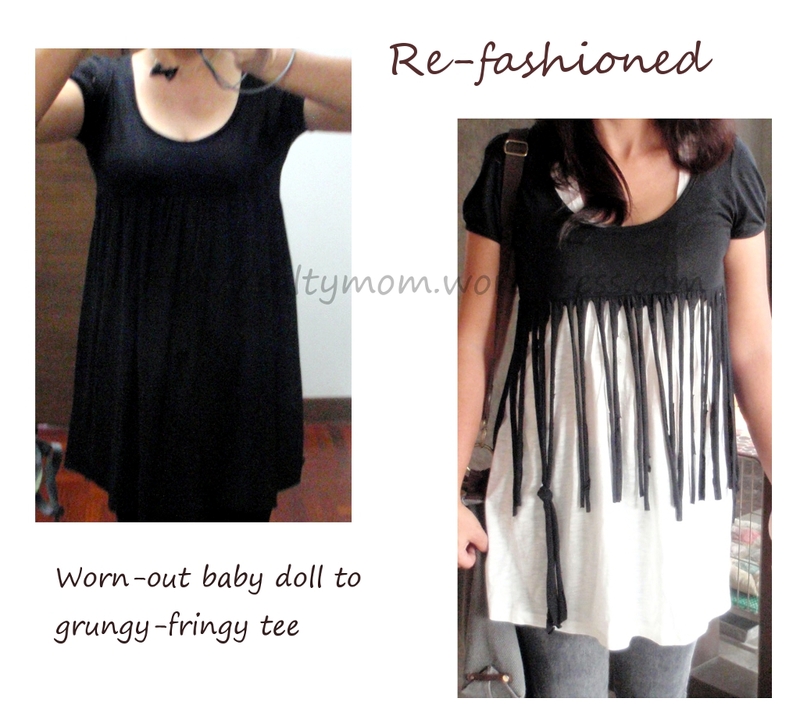 Cut off the bottom hem of the baby doll tee. Lay it out as flat as possible, and start cutting from the bottom, up to the bust line, evenly spaced, all around. My fringes are 2 cms wide ( or 3/4th of an inch ). Pick up a couple strands in your hand and give them a tug. Do this to all the strands. This will make the fabric curled into itself and somewhat fix the length. Later on, when you throw it into the washing machine, the fringes won’t grow longer that much. Put it on, stand in front of a mirror and style the length. You can do diagonal, even length, short , long, whatever that looks good on you. I left 3 strands in its original length and tied it together. I love that the fringes sway when I move around and it gives me a strange urge to go to a rock concert. Absolutely in love with your blog – and this is among my favorite post….yup, I gone through all of your posts….They are too amazing to miss – will drop by more frequent and thanks for the sweet comment you left in my blog! btw, I see your coin pouch reached no. 1 in cut out n keep. Congrats!